Realistic Rock for Kids is a method by drum legend Carmine Appice (Vanilla Fudge, Rod Stewart, Jeff Beck). 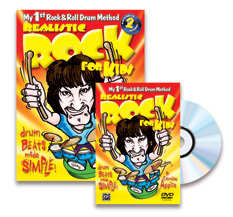 Similar to his award-winning method Realistic Rock, this book, 2 CD, and DVD kit shows kids how to play rock 'n' roll drums the quick and easy way. The book teaches basics such as note reading, holding the sticks, simple hand/foot coordination exercises, and more. All of the exercises are performed on the accompanying CDs, and the discs also include recordings of Carmine rockin' out with his band and special play-along tracks. Lastly, the DVD brings it all home and is hosted by Carmine and his star pupil, 12-year-old contest winner Pete Biggiani.